The following review does contain some minor spoilers for the Far Cry 5 short film, Inside Eden’s Gate. Following the rumor of an insidious cult abducting people in Hope County, Montana, a trio of vloggers head into the eye of the storm to find out if the rumors are true. Inside Eden’s Gate is almost horror-film campy starting out. I’m practically yelling at the screen that they should have just gone to the authorities instead of happily jumping in a car with their cameras to capture the story for themselves (they do mention something about the authorities not doing anything, and the intro to the game plays on this further, but it seems odd in a standalone film). Of course, people love campy horror flicks, and the happy-go-lucky innocent nature of the protagonists being faced with the impending awful that is about to come down on them is part of the joy of these films. You know immediately that this little journey into the lion’s den isn’t going to go by without something horrible happening. After getting to the town, they meet with their contact, a man who says his sister was taken by the cult and now isn’t the same. After some spying, they discover that the residents of Hope County are being “baptized” using a strange blue liquid poured into the pond, likely some kind of personality altering drug to keep followers calm and complacent. It’s not long before things go south for the group though. They get their hands on some guns and somehow know how to shoot like pros (criticisms of Far Cry 3’s Jason Brody and his sudden affinity for firearms and killing immediately come to mind). In traditional video game magic fashion, vloggers suddenly know how to handle weapons and kill like professionals. Inside Eden’s Gate gets far more enjoyable when you take it for its title. Just like horror movies are all about the antagonist (Jason, Freddy, Michael Meyers, etc. ), the vloggers are simply a vehicle to introduce prospective Far Cry 5 players to The Father, his siblings, and give some clues into how his mad cult, Eden’s Gate, might operate. At one point the protagonists are captured and some indoctrination takes place with The Father preying on weakness and doubts. While his methods may seem extreme, he suddenly becomes a believable monster. His calm and cool demeanor seems to seek what he honestly believes is best for those around him. It may seem absurd at a glance, but if you think about cults through out history, Joseph Seed’s methods are undeniable. 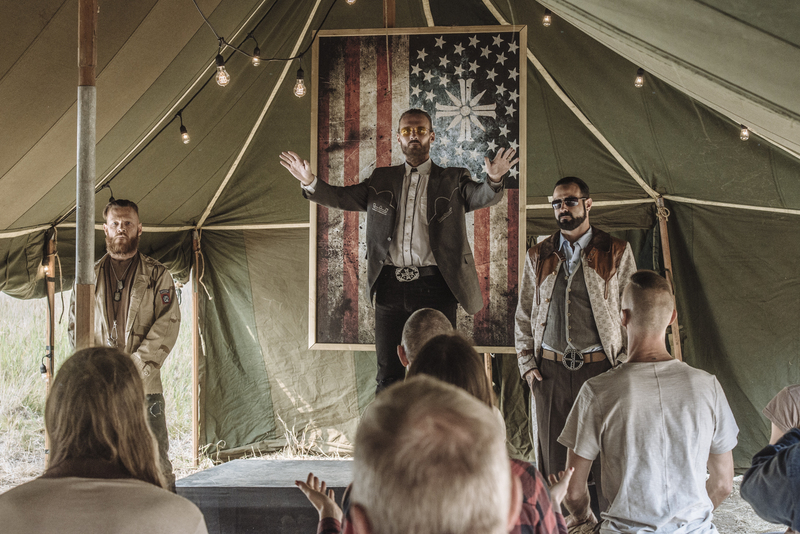 Ubisoft worked with a cult expert on Far Cry 5, so Eden’s Gate is built on the knowledge of how actual cults have operated. Charles Manson got people to murder for him. Warren Jeffs attracted more than 10,000 followers. Jim Jones convinced 900 people to commit mass suicide. There’s no shortage of evidence to show that cults can quickly take hold of people and give them something to follow in their weakest moments. In that respect, it’s not too far fetched to think that the modern social generation wouldn’t try to get their own scoop on what’s going on. Inside Eden’s Gate seems unbelievable because we don’t want to believe that things like that can happen in our own backyard, but the reality is far more grim. At 30 minutes long, I felt there were some threads that were either left dangling or progressed too quickly. The character development of Joseph Seed exploiting one of the main girl’s weaknesses came suddenly. It wasn’t preceded by implicit indications or clues about her past that might have made her indoctrination believable. That’s the charm of horror movies. You don’t have to know about a character’s past to get caught up in it. When the villain is reliant on psychological manipulation of his victims, however, the history of these characters becomes more important than ever for believability. There are some subtle hints that she might be easily persuaded by The Father’s words, but a bit more characterization could have helped this lengthy scene land better. On the other side of the table though, Greg Bryk’s Joseph Seed is the clear highlight of the film. His portrayal of The Father is eerily charming. He’s not your typical obviously evil supervillain. Instead, his machinations run much deeper, and Bryk offers a cunning performance of one who might easily needle people psychologically until he touches on the darkest hidden parts of their psyche. He exploits people’s needs and fills in the holes in their lives. He seems to believe every word that he speaks, which makes it easier to swallow for those he preaches to. This is exactly the kind of conniving qualities that a cult leader ought to have, and just in watching the film, he almost had me convinced. Bryk is the same actor that portrays The Father in Far Cry 5, so there won’t be any disconnect going from the film to the game. I was a little torn out of the moment by the blue liquid that followers are forcibly baptized in, presumably some kind of drug that induces complacency and fealty to the cult. Previous cults have relied on charm, circumstance, and abuse, though drugs were often used to keep followers out of their own heads and maintain that loyalty. Perhaps a longer run time could have afforded the opportunity to examine this point a little more, but it’s also just as likely that it will be examined further in the game. If Inside Eden’s Gate were a standalone film that had no connection to a game, I might take far more issue with these criticisms. As a prequel for Far Cry 5, it’s clearly hinting at threads that will be explored more in-depth in the game, but it does leave the film feeling a little bare in some aspects. The ending is horrifying and grim though. It makes a clear connection to the opening of Far Cry 5, setting up the reason for your own dive into the jaws of madness as the player character. 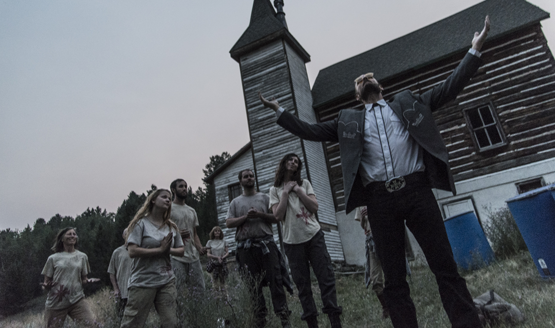 Greg Bryk has a memorable performance as Joseph Seed, the leader of the Eden’s Gate cult. From a production standpoint, Inside Eden’s Gate does have a lower-budget flair to it. Some of the color corrections on angle changes don’t match up, highlighting the use of different cameras that they attempted to unify in post-production. Most of the movie is made of high-quality acting and scenes, mixed with a handful that seem hastily cobbled together. Again, taken as a free (for Amazon Prime members) movie that is strictly set up to be a prequel for Far Cry 5, some of these low-budget corner cuts are a little bit easier to swallow. Inside Eden’s Gate was never intended as a big-budget film production, and it’s far higher quality than I would expect for a free short film meant to be an lead-in to a video game. The film’s introduction to The Father presents what could easily be one of the best Far Cry villains yet and provides a lot of background before the game even gets started. I don’t imagine watching the short film will be necessary for a Far Cry 5 playthrough, but I’d be willing to bet Ubisoft included a number of cross-references and Easter eggs between the two. The end of the film gives the possibility for character story threads to continue into the game, and I’d be interested to see if Far Cry 5 has any overt references to the characters and events of Inside Eden’s Gate. It might not be competing for an Oscar, but if you’re excited for Far Cry 5 and have an Amazon Prime subscription, Inside Eden’s Gate is well worth 30 minutes of your time to watch. Inside Edens Gate review screening took place at a Far Cry 5 event held by Ubisoft. A second viewing was done using Amazon Prime post-release. Travel and accommodations were provided by Ubisoft for the event.